The group Mass Ensemble http://www.massensemble.com/ just finished a four-day stint at the Lexington (KY) Idea Festival http://www.ideafestival.com/. 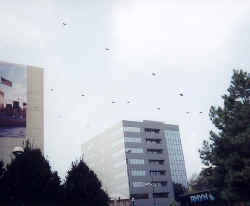 I saw three of their public outdoor performances that included the use of their long-string installation they call the Earth Harp. 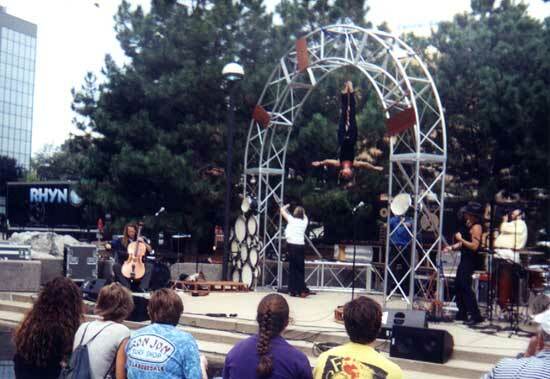 The earth Harp consists of a large tubular aluminum base unit that includes a "bridge" that is the ground level terminus for the roughly 16-20 heavy bronze strings. The bridge is a semi-circular box with an open front, aluminum frame and plywood surfaces that act as a resonant chamber. It is held down by sandbags. There are acoustic microphones set on top of this unit. 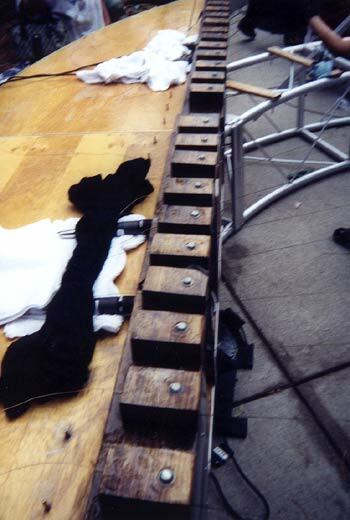 The strings are all pulled tight to roughly 30 pounds tension, but since they are played using the longitudinal standing waves, the tension is less important than the length, which they have predetermined mathematically and attached small wooden blocks at the appropriate place on the length of the string. (E.g., middle-C is 42 feet). 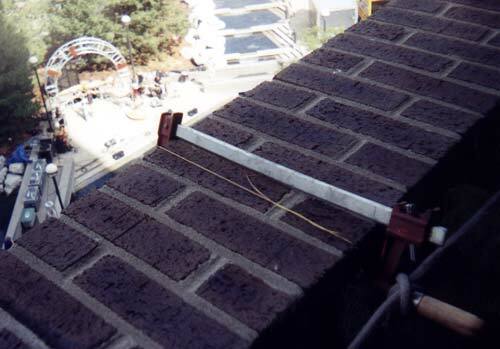 The far end of the strings were attached to a wall at the top level of a parking structure across the park, which was roughly 150 feet from the bridge. The strings are played using gloves with powdered rosin and simply rubbing the strings along their length. 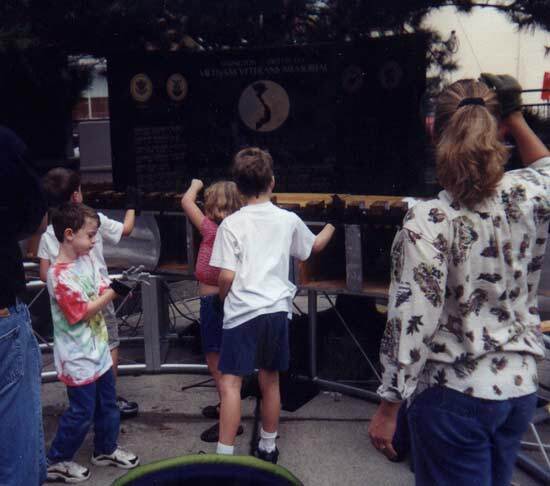 The audience was allowed to come up and try it between sets. It was very easy to play and had a wonderful sound (there are samples on their website, I believe). 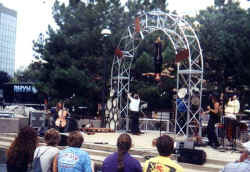 The ensemble consisted of Earth Harp, cello, French horn, bass/guitar/percussionist, drummer (traps), and two female dancers. One of the more interesting instruments they played was the "drumbrella". 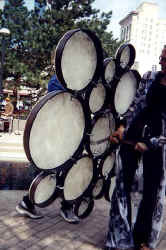 This was a bunch (maybe 20 or so) of standard Remo hand drums that were attached together into an array that could be carried from the back by a central tubular handle. The whole assembly was held together by lots of C-clamps. At one point one of the performers picked it up and started spinning it from the back while three others drummed on it with sticks. The repertoire of the group seemed to be fairly limited. I heard them three times and they did basically the same set every time. Included were an interpretation of Ravel's Bolero, which they didn't really have the instrumentation to carry off, and Cream's I Feel Free. 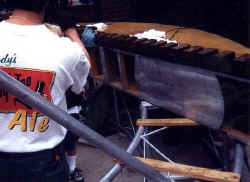 The Earth harp was used primarily to provide a drone or simple ostinato patterns. They used a hired company to do their sound, which they seemed to have a lot of problems with. The balance was never right. I was not much impressed with the performances of Mass Ensemble, but the demonstration of the long-string Earth Harp inspires me to experiment more with that concept.